Phil Luangrath was born in Laos and immigrated to the US in 1980. He graduated in art from CA State University Long Beach. He held many different odd jobs to avoid becoming a professional artist. There was never a blank page in his notebooks that wasn’t filled with all sorts of pencil drawings while growing up. If not drawing, he would be daydreaming about traveling to a far far places. These days, he travels for his work collaborating with different artisans and jewelers that help produce his designs. Phil is well traveled. Many of his designs and art work are drawn from the richness of his travel experiences. Favio grew up in Argentina and came to the US when he was 18 years old. He started collecting tin toys when his uncle would bring home a suitcase load when returning home from many trips abroad. Everyday after school, at the age of six, his father would take him to his metal factory where he started to play and learn how to work with metal. His love for exotic cars began when he got his first BMW at the age of 16; a surprised from his parents hoping to deter him from immigrating to the US. The two met in 1996 and have been in partnership ever since. Their first and continuing collaboration is metal fabrication. 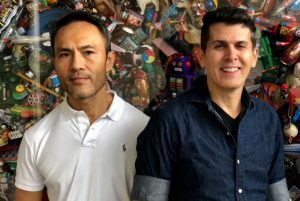 In their Miami art studio, Phil and Favio would make decorative objects, occasional furniture and lighting to the design trades, interior designers, and high end retailers like Neiman Marcus, Gumps, the Ritz Carlton, and many other fine boutiques throughout the US. For the last ten years, they ventured into designing exotic skin leather goods under their own retail and private labels. Within the last five years, they have added vermeil and fine jewelry into their design portfolios specializing in color gemstones. They continue to design and fabricate metal art work for private clients throughout the US. Tin toys are the latest mediums they are working with. It demonstrates their love for shapes, colors, and textures as prevalent in their other design works. It’s their personal interpretation of life that is chaotic but contained, filtered and selective. All the while, trying to keep alive the childhood memories, nostalgia, and to remind themselves that art, similar to life, can be happy, colorful, and playful. Phil Luangrath & Favio Landeira are two immigrant artists who made their home in Miami, collaborating on stunning sculptures. Originally from Laos and Argentina, they now make futuristic half globes. 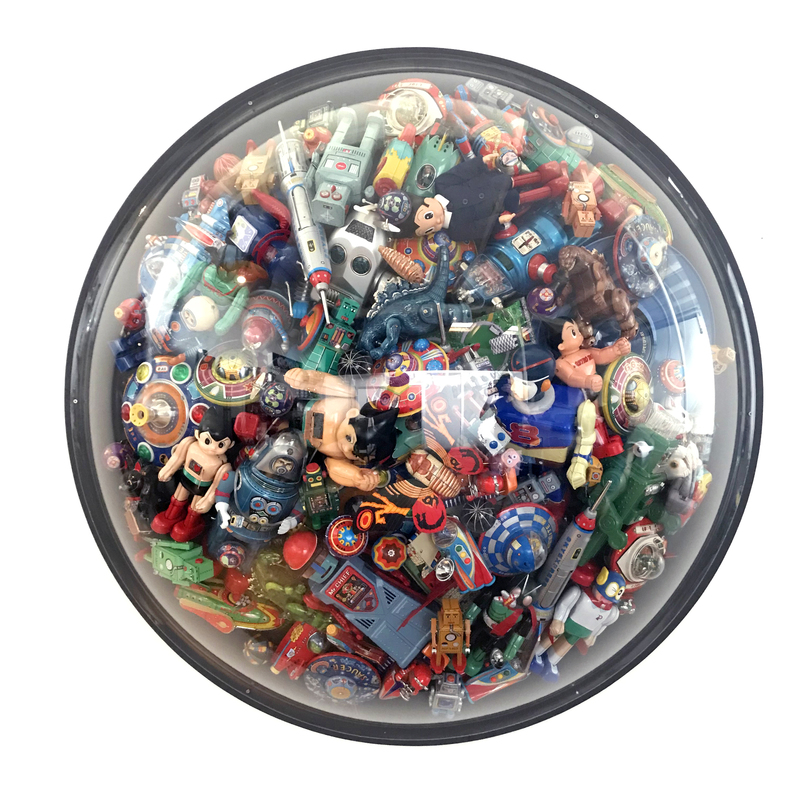 Beautifully placed toys are precisely placed on metal rods, protected by museum quality glass. Filled with Japanese cats and familiar American figurines, this piece transfixes all ages. 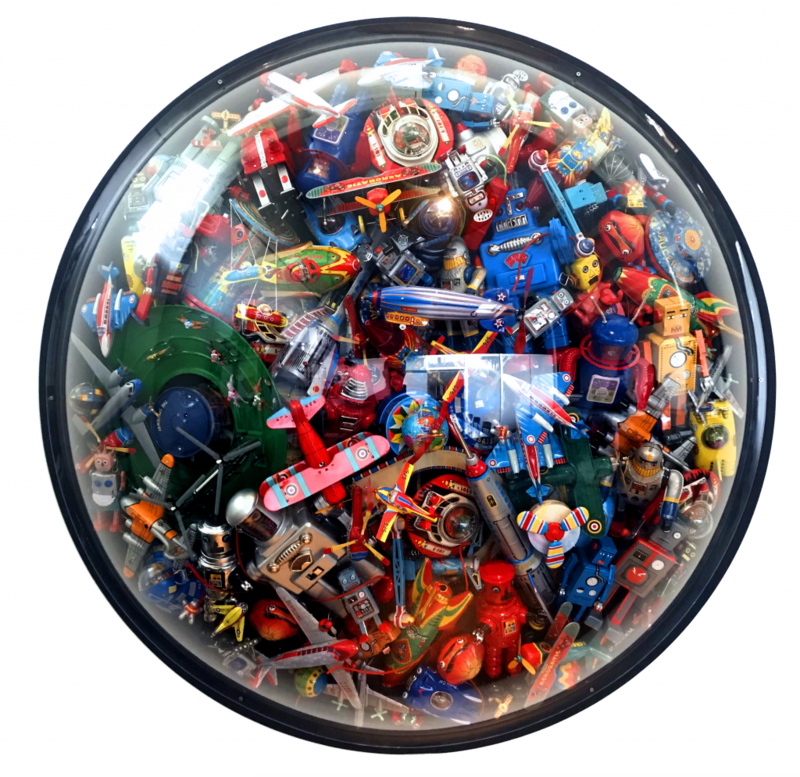 With a nod to the history of aviation and the connectedness typical of our time, they built another half globe composed simply of rare vintage airplane toys. Their work inspires joy and conversation in every viewer.